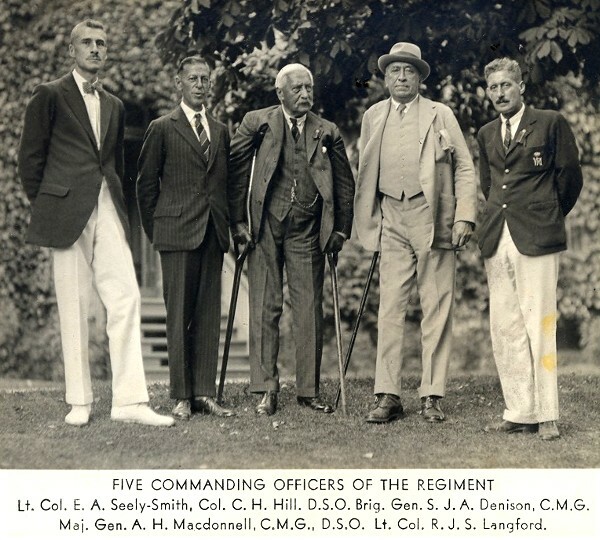 Officers of The RCR (CEF) - Lt.-Colonel A.H. MacDonell, C.M.G., D.S.O. » Lt.-Colonel A.H. MacDonell, C.M.G., D.S.O. The Hon. Archibald Hayes Macdonell, C.M.G., D.S.O. Major-General A.H. Macdonell, C.M.G., D.S.O. Mentioned in Despatches: THE LONDON GAZETTE, 8 February, 1901 - Lieutenant and Adjutant A. H. Macdonnell, Captain, Royal Canadian Regiment of Infantry. Mentioned in Despatches: THE LONDON GAZETTE, APRIL 16, 1901; Earl Roberts' Despatches: Captain A. H. Macdonell, Royal Canadian Regiment. THE LONDON GAZETTE, JANUARY 21, 1902; Lieutenant A. N. Macdonell, D.S.O., Royal Canadian Regiment of Infantry (Major Canadian Militia), is granted the local rank of Lieutenant in the Army whilst employed with the West African Frontier Force. Dated. 28th December, 1901. West Africa (S. Nigeria) 1901-02. Aro Expedition - Medal Clasp. Operations in the Ibeko Olokoro (Clasp). West Africa (S. Nigeria) 1902-03. Operations in the Afikpo Country - Despatches (Clasp). West Africa (S. Nigeria) 1903. Operations in the Mkpani Country (Clasp). West Africa (S. Nigeria) 1904. Operations at Obokum (Clasp). A.A.G. i/c Adm. 1 Div. 1911. G.S.O 2nd Grade, 1st Div. 1913. (Great War) O.C. 5th Inf. Bde. 1916. Despatches (3). C.M.G., 1914-15 Star, British War Medal, Victory Medal. SUPPLEMENT TO THE LONDON GAZETTE, 3 JUNE, 1916; Additional Members of the Third Class, or Companions, of the said Most Distinguished Order of Saint Michael and Saint George. - Lt.-Col. Archibald Hayes Macdonell, D.S.O., R. Can. R.
9 Nov 1937: Major-General, The Hon. A.H. Macdonnel, C.M.G., D.S.O., Retired List, is appointed Honourary Colonel. Five Commanding Officers attend the 1933 reunion at Wolseley Barracks, London, Ontario. Operations in Orange Free State, February to May 1900, including operations at Paardeberg (17th to 26th February); actions at Poplar Grove (7th March); Driefontein (10 March). Operations in Transvaal, east of Pretoria, July to 29th November, 1900. Operations in Cape Colony, south of Orange River, 1899-1900. Served as Battalion Adjutant, 2nd Bn, R. Can. Regt. of Inf., October to December, 1899. Despatches. London Gazette (2), 8th February and 16th April, 1901. Canada Gazette. D.S.O. Brevet of Major. Queen's Medal with four clasps. West Africa (S. Nigeria), 1901-2. Aro Expedition. Medal with clasp. West Africa (S. Nigeria), 1902. Operations in the Ibeku country. Operations in the Ibeku-Olokoro. Clasp. West Africa (S. Nigeria), 1902-3. Operations in the Afikpo country. Clasp. Despatches. London Gazette, 28th October 1904. Clasp. West Africa (S. Nigeria), 1903. Operations in the Mkpani country. Clasp. West Africa (S. Nigeria), 1904. Operations in the northern Ibibio country. Operations at Obokum. Clasp. MACDONNELL, Hon. Archibald Hayes, C.M.G. 1916, D.S.O. 1900; senator; late Canadian military service; b Toronto, Ont, 6 Feb. 1868; s Angus Duncan of U.E.L. descent, and Pauline Rosalie (de Lehaye) M., both Candns. ; e model sch. and coll. inst,, Toronto; m Mrs. C. J. Coster, 6 June 1934; joined Candn. vol. mil. Feb. 1886; perm, corps., Apl. 1892; served with 1st Candn. contingent in S. Africa; mentioned in despatches twice; D.S.O. bt. maj.; awarded Queen's medal with four clasps; served in W. Africa with Southern Nigeria Aro Expdn., 1901-02 (medal and clasp); Ebeko Expdn. (clasp); Ibeko-Olokoro Expdn. ; Afikpo Expdn. (clasp and despatches); Mkpani Expdn. (clasp); Northern Ibibio Expdn. ; operations at Obokum (clasp); passed Staff Coll., 1906; served in World War, 1914-17; on 1st Divn. Staff until Aug. 1915 as lieut-col.; commanded Roy. Candn. Regt. in trenches until Apl. 1916; and then commanded 5th Candn. Bgde. until 23 July 1917 mentioned in despatches three times; organ. N.B. into a mil. dist, 1 Nov. 1917, and commanded it up to time of being summoned to the Senate, 1921; retired to pension, 15 Jan. 1922; Conservative; Roman Catholic; recreations big game hunting, sports; Club Sevogle Salmon Fishing (N.B. ); Address The Senate, Ottawa. Archibald Hayes Macdonell (Toronto, Ontario 6 February 1868-12 November 1939 Rothesay, N.B. ), a descendant of United Empire Loyalist, began his military career in 1886, when he joined the militia in Toronto. In 1899 he joined the first Canadian contingent serving as captain of 'H' Company, Nova Scotia. In December of that year Macdonell was given command of 'G' Company at Belmont, South Africa. At Bloemfontein in early April of the following year Macdonell became ill with enteric fever. During his illness his command was taken over by Frederick Caverhill Jones. 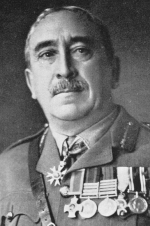 After recovering, Macdonell was to return to his Regiment when the Boers attacked his camp. Macdonell and the others present at the station quickly realized that they were surrounded by the Boers led by General Christiaan Rudolf de Wet (1854-1922). Macdonell refused to surrender but after six hours of constant enemy fire, with ten dead and seventeen severely wounded, and no chance of reinforcements, he was forced to do so. De Wet marched the prisoners to his farm at Vaal Krantz, but learning that the British were approaching, De Wet fled leaving the prisoners behind at Farriesburg. Macdonell and the other prisoners were able to escape and rejoin 'G' Company. In recognition of his bravery during the war Macdonell received the Distinguished Service Order and rank of brevet major along with the Queen's medal with four clasps. In 1901 Macdonell joined the British again, this time to fight in the Aro Expedition in Southern Nigeria. For gallantry in action, he received the following medals: Ebeko Expedition (clasp), Ibeko-Olokoro Expedition (clasp), Afikpo Expedition (clasp and despatches), Mkpani Expedition (clasp), and for Operations at Obokum (clasp). Like Frederick Caverhill Jones, Macdonell went on to serve in World War I, first as part of the First Divisional Staff and then serving at the front lines commanding The Royal Canadian Regiment. After returning to Canada, he came to New Brunswick and organized the province into a military district on 1 November 1917. He served as commander until November 1921, when he was summoned to the Canadian senate. Major-General Macdonnell served in The Regiment from 1892 to 1916 during which time he attained the rank of Lieutenant-Colonel. During the South Africa War he was twice mentioned in despatches and awarded the Distinguished Service Order. While in Africa, he served and received four bars to the Queen's Medal for service in operations at South Nigeria, Aro Expedition, Ibeko-Olokoro and Obokum. In 1907 he was appointed Deputy Assistant-Adjutant General and later Deputy Assistant Quartermaster General. In 1908 he was an elected Member of the Federal Parliament. In 1910 he was appointed Command Staff Officer for Western Ontario and in 1911 was the Assistant-Adjutant General in charge of Administration in 2 Division and later the GSO 2 of that Division. During the Great War, after leaving the command of The Regiment, he was promoted to command 5th Canadian Infantry Brigade, receiving the Companion of the Order of St. Michael and St. George as well as being mentioned in despatches three times. On November 9th 1937 he returned to the Regimental fold on accepting the appointment of Honorary Colonel of The Regiment which he held until his death on November 12th 1939. Date of Birth - 6 Feb 1868, at Toronto, ON. Date of Death - 12 Nov 1936, at Rothesay, NB.